Konnyaku Kinpira Recipe. It very easy to make and very healthy with plenty of dietary fiber! Anyone who is Japanese knows what is ‘kinpira’. It is a simple traditional style of Japanese cooking which is a big part of family life and many of the Japanese use our original kinpira recipe passed down from generation to generation, and it is even served in school lunch! It be summarized as a technique of "sauté and simmer". Most recipes use finely sliced root vegetables with spices. 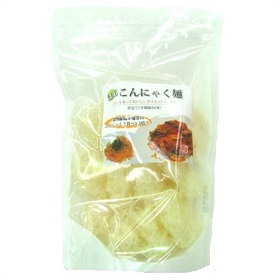 It is commonly used to cook root vegetables such as carrot, burdock (to make kinpira gobo) and lotus root, seaweeds such as arame and hijiki and other foods including tofu and wheat gluten (namafu), and even meat (chicken, pork, beef). Today we are introducing konnyaku kinpira. It very easy to make and very healthy with plenty of dietary fiber! 1. Prepare the konnyaku noodles. Bring water to a boil in a pot, put in the dried konnyaku noodles. Then remove from the heat, let the noodles rest for 7 minutes. Drain the konnyaku noodles in a colander and rinse them under the tap with hot water (the rising in necessary to remove the tapioca syrup coating). 2. Heat sesame oil in the pan. Then add the chili flakes and put the konnyaku noodles. 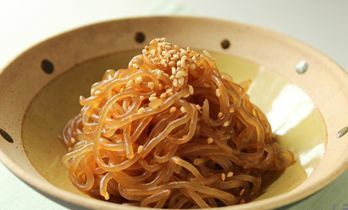 When the oil spreads over konnyaku noodles put mirin and soysauce and mix well. 3. Remove from the heat and serve in a dish. Enjoy!